After a lot of work and with a great deal of help, the prototype SSDT: Arcade Edition cabinet is upright, functioning, covered in art, lights up and feels like it is finally an arcade game. It is a magical moment when you put in a quarter and hear the noise that only a quarter going into an arcade game can make and it all works. Other times there’s horrible bugs! But now I think the cabinet is ready for real world testing and will be in the wild very soon. I can test with Xbox One controllers all day long, but sometimes there’s a bug I simply have to test with the arcade sticks. 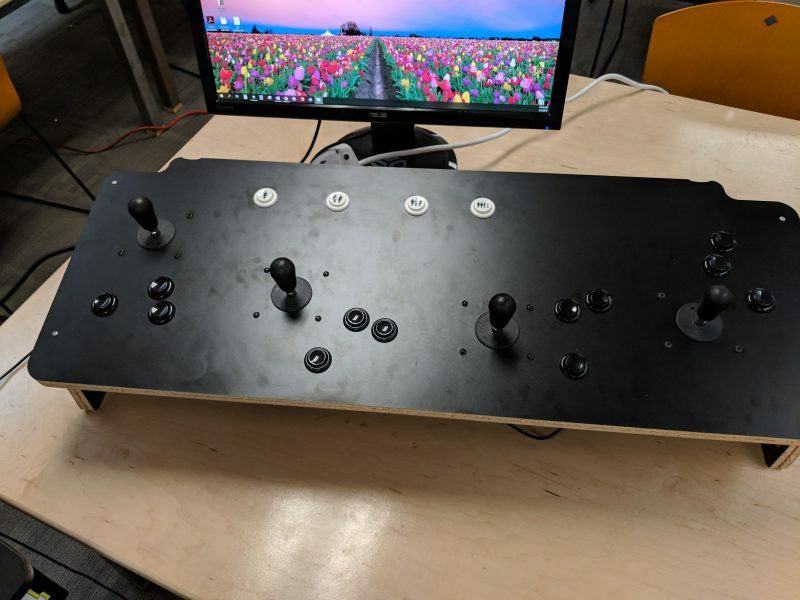 Since the prototype was going out into public, I wanted to put newer sticks in it. Now the old ones I was using are getting a new lease on life as a test control panel. I can plug this beast in during times of extreme testing without having to physically have the arcade sitting next to me. Fortunately there were errors in the sides and top of another panel, so I got to re-purpose these pieces and use some spare wood to build a frame. I mentioned when this whole arcade thing got started that I would continue to work on things that would overlap with work that needed to be done on the Xbox One version. Working on Arcade Edition helped focus my attention on the difficulty curve of the various states of AI. The jump from easy to hard is pretty sharp. 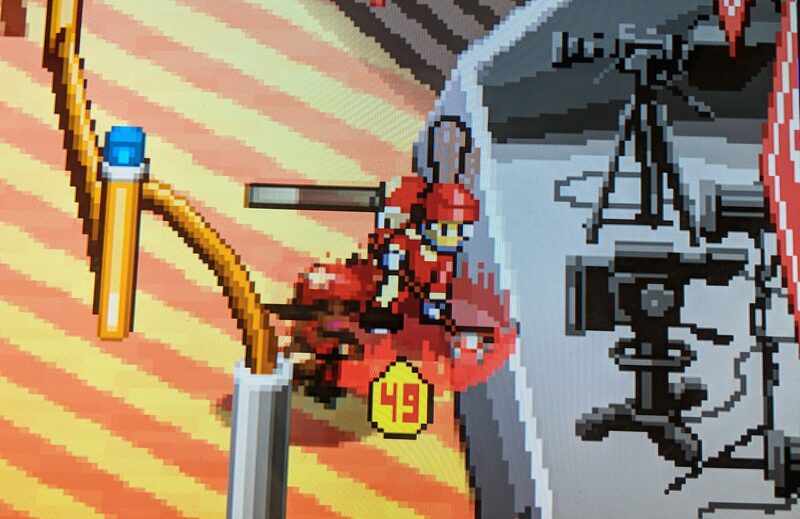 Also, at higher levels, the AI buzzes on you like an angry hornet. Sometimes your AI buddy is just making poor choices and even the goalies could be better. All of these areas have been improved on, and will be part of making the Xbox One version better. I will get more feedback on these improvements once the arcade is in the wild. End Zones were a feature I had added and tested a few times at public events, but it had not been thoroughly tested. The AI and goalies in particular had problems, and I even found an exploit where you could score and just hide around your goalie until time runs out. These have been improved, and your goalie will now simply chuck the ball if he can’t pass to anyone to avoid the exploit. Since End Zones are also a part of the Xbox One release, it will be good to get feedback in the arcade from people on this mode as well. No, it’s bad word. I’m deeply sorry that I haven’t been able to finish the Xbox One version of the game, though considerable progress was made last year on it. If I can sell arcade cabinets and some money can come in, I can keep writing the Xbox One port. Running a business costs money and I simply have to make some. In the past years I’ve had to press pause on SSDT to write and license web games or to do contract work for some income. This time I am hoping for a better pay out so I can keep doing this. 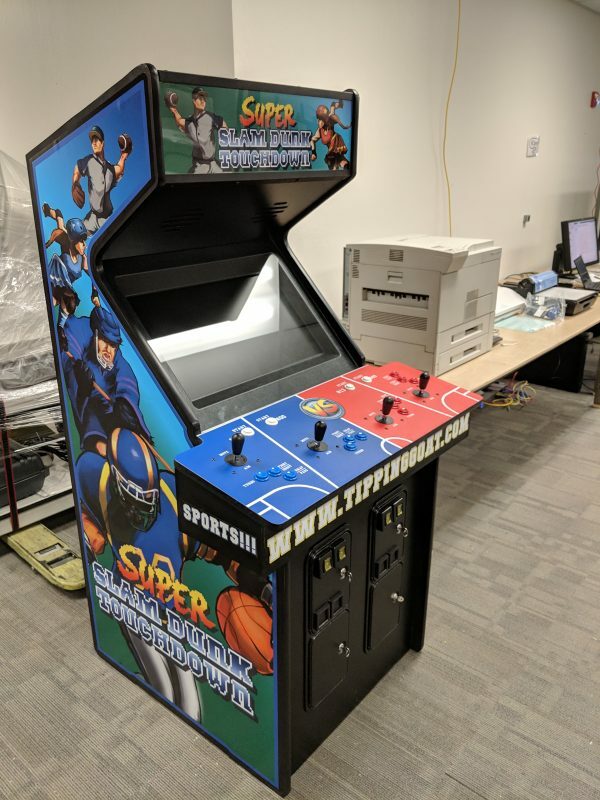 I have been in full sprint mode to finish the arcade cabinet prototype, and the next phase is to build a commercial model for sale. I will continue to communicate where work on the Xbox One version continues as all this unfolds.